What an amazing trip! A side of the area we’ve never seen before. Beautiful! So much to be thankful for right in our own backyard! Fox River Environmental Education Alliance is happy to share the Happy Trails Event happening along our Fox Riverfront. The fourth annual Happy Trails event will be held at Telulah Park on Saturday, May 31 from 9 a.m. to 1 p.m.. This year, the run/walk course will travel across the College Avenue bridge into the Lawrence University area, down South Lawe St. onto the riverfront North Island trail and then return to Telulah Park via the Newberry Trail. The new course was designed to avoid construction on the Newberry Trail near the park. 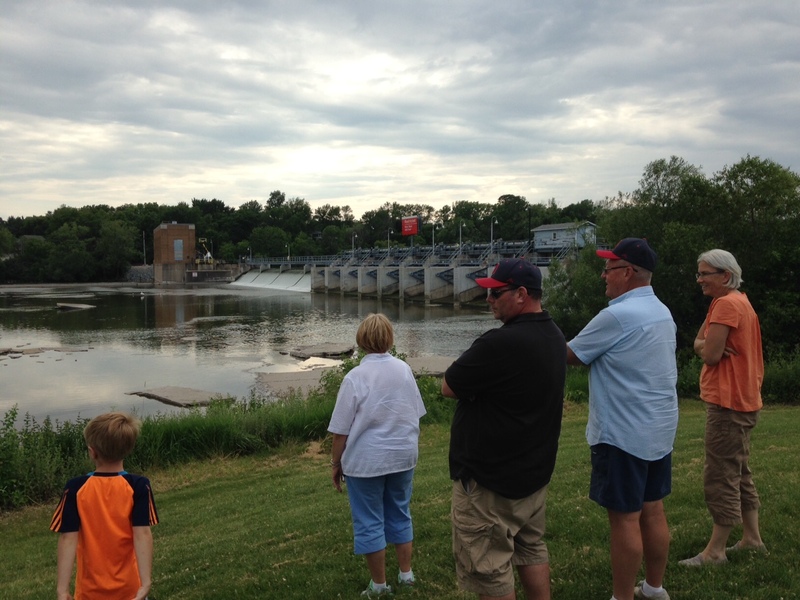 Fox Cities Greenways is teaming with Lawrence University, Downtown Appleton Inc. and other groups from the Appleton community to help share the story of the Fox River with local trivia placed along the course. Also new this year will be live music along the route, including Appleton’s Steven Walsh playing the bagpipe. The Appleton Rock Band will provide live music at Telulah Park following the run/walk. Happy Trails was launched in 2011 to showcase Appleton’s Downtown scenic riverfront trail system and the new water trail portages on the Fox River. The event includes a 6K (3.66 miles) run/walk along the riverfront trails and a 10-mile bike ride from Telulah Park along the CE trail. Participants can choose to do one or the other, or both. 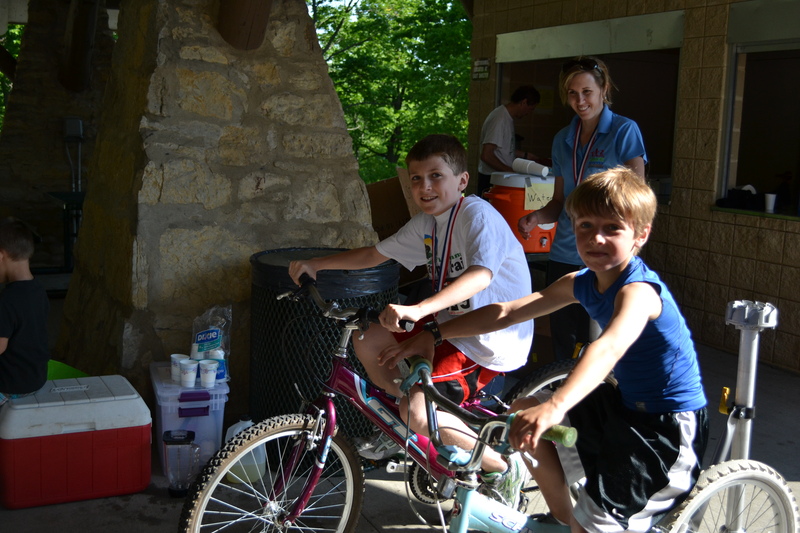 Once again, Happy Trails will feature a kids’ bike rodeo for ages 5-12, kids’ bike helmet giveaway, and rowing demonstrations by the Fox Valley Rowing Club. Displays and refreshments will be featured at Telulah Park, along with chances to win prizes from event sponsors. Other features include free refreshments and t-shirts for participants, a face painting station, handcrafted soda by Stone Cellar Brewpub, and trail map displays. 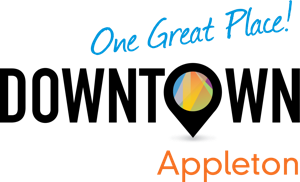 Event organizer and avid runner Gordy McDaniel said, “The great thing about these trails is that they connect neighborhoods to other places in the community: Downtown Appleton, Lawrence University, restaurants, parks. It is so much easier to get places without having to drive,” he added. 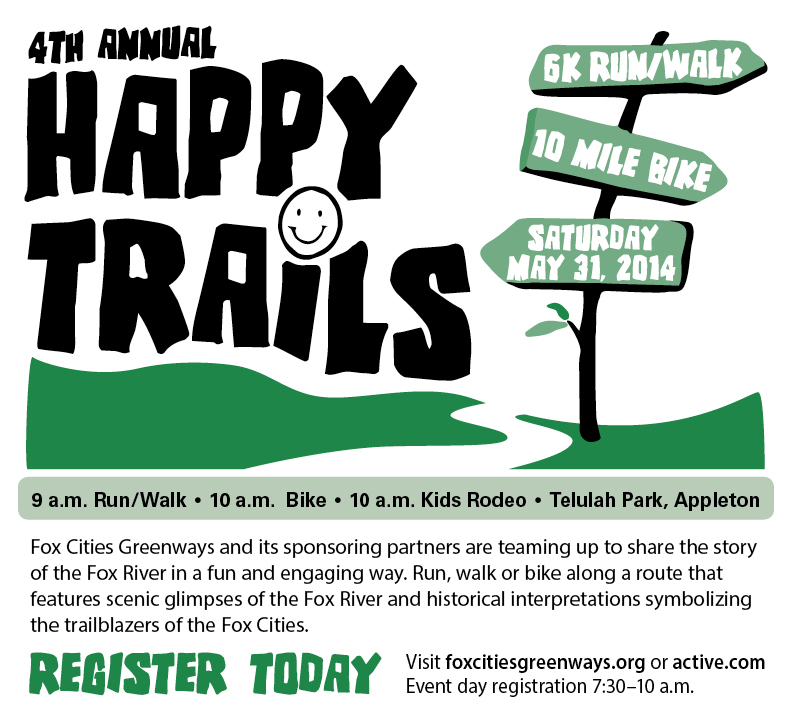 Proceeds from event registrations support the Fox Cities Greenways, a nonprofit organization dedicated to the development and preservation of trails. or the day of the event from 7:30 a.m. to 9 a.m at Telulah Park. For more information, contact Gordy McDaniel at 920-788-9545. Thanks to the Focus on the Fox for this article about our downtown riverfront. Some winters can seem to drag on forever in Wisconsin, but experts agree that the best way to get through the colder months is to embrace it! Fortunately, more and more winter activities are springing up along the Fox River than ever before. Even if you are not a fan of winter sports, there are plenty of other outdoor and indoor activities and events that you can enjoy. If you missed some of these events this year, be sure to put it on your calendar for next year! There are still some you can take advantage of before winter melts away. Candlelight Walk by Light up the Fox – A candlelight walk and lighting ceremony launched a new Riverfront LED Light Display on Dec. 21, 2013. The non-profit group led a procession from the historic Atlas Mill across the Olde Oneida bridge and back, visiting reflective stops along the way. Light up the Fox Display – The LED light displays on W. Water Street were designed and built by students from Little Chute and Tesla – Appleton East high schools, in conjunction with Fox Valley Technical College. This riverfront attraction was on display from Dec. 21 to Feb. 11, 2014. Eagle Days on the Fox River – The second annual Eagle Days event was held Jan. 25 at 1000 Islands in Kaukauna. People came from throughout Wisconsin to take part in activities, presentations and eagle viewing opportunities at the center. Illuminated Skate Show – On Feb. 8, Light up the Fox hosted an illuminated Skate Show at Jones Park to celebrate Thomas Edison’s birthday and mark the end of the riverfront light display. The event featured open skating, ending with a performance by the Valley Figure Skating Club. 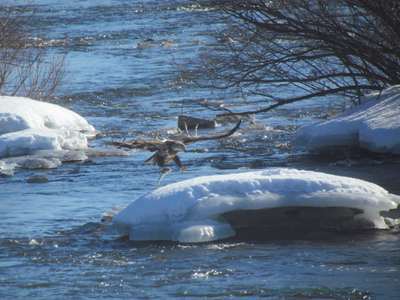 Waterfowl and Eagle Viewing along the River – There are many great indoor venues with close-up views of bald eagles and other waterfowl fishing in the river. 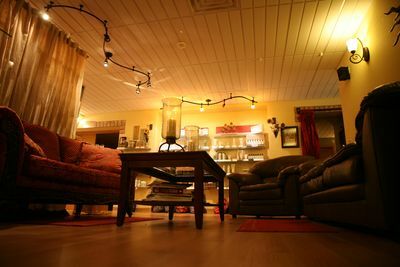 Try Fratellos, Pullmans, Atlas Coffee Mill and Paper Discovery Center for the best views in a cozy, warm setting. Riverview Gardens – This self-sustaining urban farm is able to provide a winter CSA (Community Supported Agriculture) shares of produce because of their unique hoop houses. There are many opportunities to volunteer at this innovative organization that is helping to fight poverty. Hiking, snow shoeing and cross country skiing are also open to the public at Riverview Gardens. Jones Park – Located at 301 W. Lawrence Street, Appleton, this 5.8 acre park offers a full-size hockey rink, recreational skating rink, warming shelter, picnic pavilion, restrooms and a lighted walkway through the park. This is one of the first parks to be developed for winter sports. 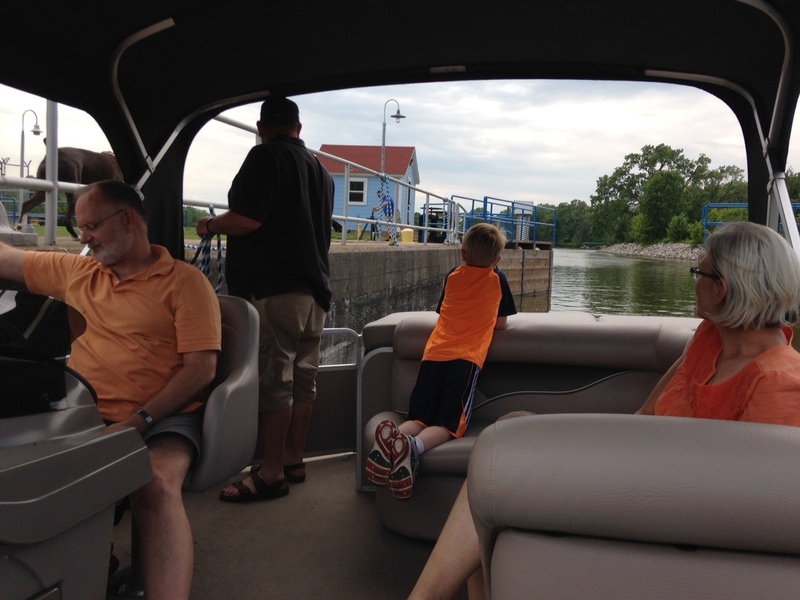 Appleton Yacht Club – Recently renovated, the Appleton Yacht Club offers scenic views of the Fox River from the clubhouse. 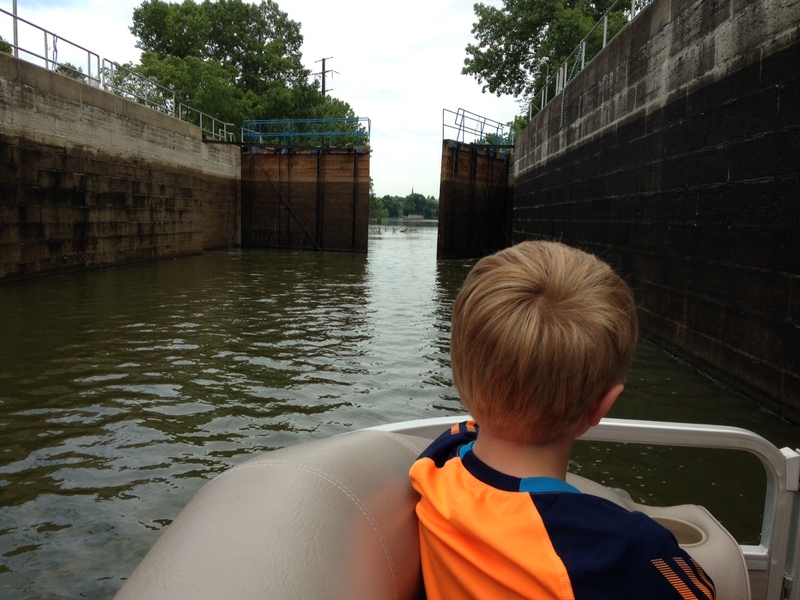 The club offers social memberships for those that do not own a boat. It has also become a popular gathering place for business networking, Friday Fish Fry and private parties. Hearthstone Historic House – Tour Hearthstone and learn about Appleton’s early electrical history. Hearthstone is the world’s first home lit by hydroelectricity. 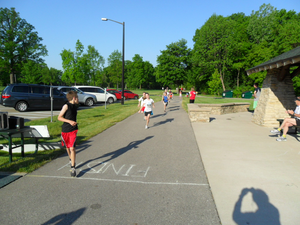 The third annual Happy Trails event will be held at Telulah Park on Sunday, June 2 from 9 a.m. to Noon. This year, Fox Cities Greenways is adding rowing demonstrations, a bike safety rodeo and free helmet giveaway to annual bike/run event. Happy Trails was initiated in 2011 showcase Appleton’s riverfront trail system and the new water trail portages on the Fox River. The event includes a 5K run/walk along the riverfront Newberry Trail and a 10-mile bike ride from Telulah Park along the CE trail. Participants can choose to do one or the other, or both. Displays and refreshments will be featured at Telulah Park, along with chances to win prizes from event sponsors. New this year will be a bike rodeo and youth helmet giveaway. A limited quantity of free bike helmets will be awarded to kids (ages 5-12) who complete the safety clinic, provided by Neuroscience Group. Also new will be on-the-water rowing demonstrations by the Fox Valley Rowing Club. “The great thing about these trails is that they connect neighborhoods to other places in the community: parks, Downtown Appleton, riverfront restaurants. It makes it so much easier to get to where you need to go without having to drive,” he added. Other features include free refreshments and t-shirts for participants, a face painting station, bicycle-powered smoothie makers, oragami craft station, handcrafted soda by Stone Cellar Brewpub, trail map displays, and prize drawings from Run Away Shoes, Recyclist Bicycle Company, Midwest Sports Events, Neuroscience Group and Eagle Flats. Make a homemade Valentine’s Day Card or Dancing Heart Dude in our Paper Lab. 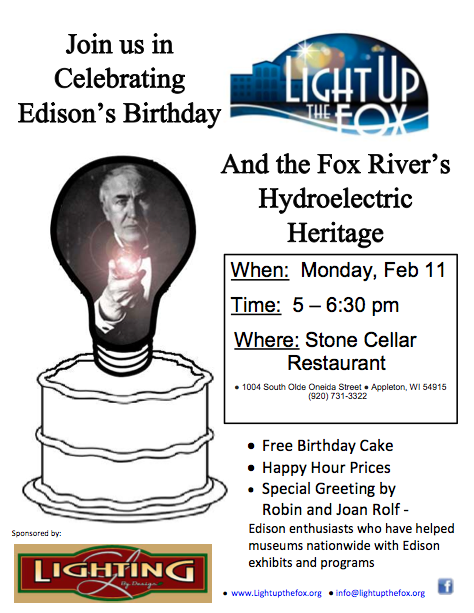 Light Up the Fox is celebrating Thomas Edison’s birthday! Birth cake, specials and more!